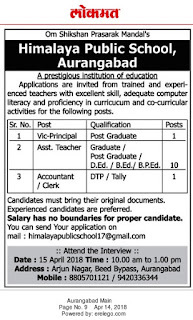 Himalaya Public School, Aurangabad has advertised in THE LOKMAT newspaper for recruitment of Vice Principal,Asst.Teachers,Accountant/clerk jobs vacancies. Interested and eligible job aspirants are requested to apply immediately and interview held on 15/04/18.Check out further more details below. Name of the School: Himalaya Public School, Aurangabad. About School: Himalaya Public School, Aurangabad,is a private school under the management of professors working in the educational field.The aim of the school is to train children to lead full and useful lives through a liberal education and broad curriculam. (b) Assistant Teachers: Graduate,Post Graduate,B.Ed,D.Ed,B.P.Ed. 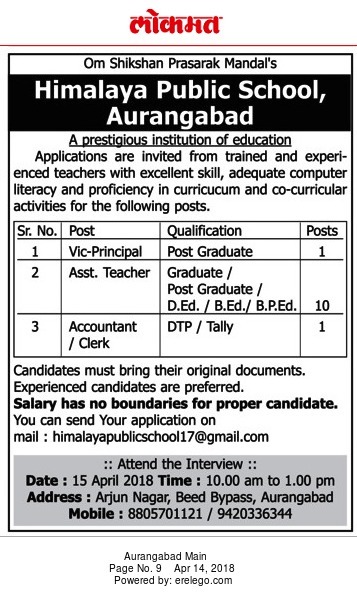 (i) Applications are invited from trained and experienced teachers with excellent skill,adequate computer literacy and proficiency in curriculam and co-curricular activities. How to Apply: Candidates must bring their original documents. Address: Arjun Nagar,Beed By pass, Aurangabad.